On the following pages you will find "hit-able" and "zoom-able" maps of Santa Cruz County. The first map indicates the general locations of (1) Toxics Release Inventory (TRI) facilities, (2) privately owned facilities that receive off-site transfers, and (3) publicly owned treatment works (POTWs). This map encompasses the entire county and within it you will find four clusters. "Zoom-in" on any cluster (Watsonville, Santa Cruz, Scotts Valley, and Ben Lomond) by pointing-and-clicking on the area of the map. A more detailed map will appear. At this second level the map will indicate local streets, roads, and highways, and the location of each facility. Stickpins, like on a map at home, pinpoint the exact location of each facility. As well, the facilities are identified by the letters (T) for TRI facilities, (O) for privately owned facilities that receive off-site transfers, and (P) for POTWs. One of these letters is on the head of each of the stickpins indicating the type of that facility. You can then point-and-click on any facility's "stickpin" to find its name, address, parent company, contact and other useful information, including a table summarizing their annual releases and transfers. You can click on a year (from 1987-1997) to view a facsimile of the detailed report submitted by the facility for that year explaining their releases and transfers in more detail. Through various links or by using our search-engine you will also find many documents that explain, tell the history, the benefits, the shortcomings, and the future of TRI and Right-to-Know reporting. There are also tables listing the human health and environmental effects of the more commonly released chemicals and metals and New Jersey Department of Public Health Hazardous Substance Fact Sheets for each TRI chemical released or transferred in Santa Cruz County. 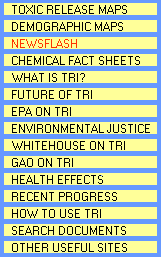 Included are several links to other sites where important information about TRI releases and transfers, government programs and documents, and environmental organizations can be found.